"Every story is true if you tell it right." 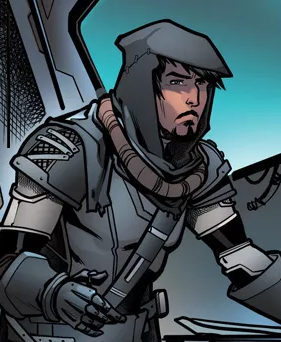 Andal Brask was the former Hunter Vanguard before Cayde-6 took the post. "I was dead, then I floated here. All I've ever done in my entire life is barf into the Pacific Ocean." Andal Brask was revived by one of the Ghosts following Micah-10, and immediately afterwards journeyed to the Last City across the Pacific Ocean. According to tales told by Andal, he was met at the City gates by the Hunter Vanguard Tallulah Fairwind, who told him that Micah had sent a message that Andal would be trouble, although he protested that his entire life up until then had just been drowning repeatedly in the ocean. She slapped him on the back so hard Andal died and had to be revived by his Ghost, but Tallulah acted like nothing had happened and pointed him towards a jumpship stolen by the House of Devils and decided to aid him in retrieving and taking it to the Ishtar Academy so the AI there could upgrade it. Andal, confused by everything that was happening, told her that he had no clue what she was talking about, but Tallulah told him to cheer up and that it was not like they were about to attack a Vex gate, at least not yet. During the early City Age, Andal was among those who assisted in the Faction Accords. Andal then formed a crew alongside Cayde-6 and Shiro-4, with other Hunters sometimes joining them on their jobs. Their missions included escorting survivors back to the Last City, mapping lost sites for technology and resources, and hunting down Fallen raiding parties. Andal and Cayde became close friends, and Brask often spun wild stories about his Exo counterpart - going as far as to claim Cayde was none other than the great Rasputin. Eventually their actions against the Fallen resulted in a large bounty of Glimmer and Ether being put on their heads by the Fallen Houses. During a mission where Andal led a team of hunters to raid one supply cache while Cayde, Shiro, Nian Ruo, and Lush hit another, Andal returned to their camp to find only Cayde, Shiro, and Lush present. He learned the other team had been ambushed by Taniks, the Scarred, who was seeking to claim the bounty on their heads. The Fallen mercenary murdered Nian in the ambush and destroyed Lush's Ghost before they escaped. Despite their loses, Andal and the others got cocky and decided to hunt down Taniks in revenge and kill him, although they told Lush he could not join them due to losing his Ghost and risking his final death. That night, Andal and Cayde stayed up late drinking and decided to make a Vanguard Dare, as the position of Hunter Vanguard had been empty for two years following Kauko Swiftriver's disappearance. They decided that whoever failed to kill Taniks would have to become the new Hunter Vanguard while the winner would continue living the life of a free Hunter. Andal lost his Dare with Cayde when his friend managed to hunt down and seemingly kill Taniks. Cayde attempted to talk him out of honoring the Dare due to the fact they had been intoxicated and their emotions over Nian's death, but Andal refused to dishonor the tradition of the Dare by backing out and causing every Hunter to doubt his word. A party was thrown in celebration of Andal becoming the new Hunter Vanguard, with even Osiris, the Warlock Vanguard Commander, attending. After joining the Vanguard, Andal conspired with Cayde and Shiro to loosen the restrictions placed upon Guardians by their commanders as they believed that hiding in the City would lead to humanity's ruin. He would also leak information to them about upcoming Vanguard operations and the locations of enemy supply stashes so they would get first crack at the loot before delivering what they did not take to the Last City. However, over time Andal began seeing things from his fellow Vanguard's perspective and grew more serious about his role as Hunter Vanguard. This created a strain in his friendship with Cayde and Shiro, who thought that Andal was selling out to the Vanguard. Despite this, Andal was still looser with regulations than his fellow Vanguards, and turned a blind eye to the research being done by a group of Guardians looking into Dredgen Yor and his fall to Darkness, although Andal did not approve of subject. At a meeting of the Consensus, Andal was present when the Speaker announced that he was appointing Ikora Rey as the new Warlock Vanguard, was banishing Osiris from the Last City, and named Zavala as the new Vanguard Commander. Andal's face in his concept art resembles that of Executor Hideo. Andal is currently the only confirmed member of the Vanguard to have a full head of hair. ↑ Cayde-6's Cloak resembles that of Andal's concept art seen in the article picture. Andal's concept art from early development of Destiny.